Oman is quite known for its amazing conditions for Wind- and Kitesurfing and one of the must-experience destinations on the globe on the bucket list of every ambitious kiter. In order to make the very best out of your journey in this still not very famous destination, here the most important facts which will help you to plan your kite holiday in Oman. 1. Choose the right travel time for your kite holiday! The best time for your kite trip to Oman is from May to September. The main wind system in Oman is the Monsoon of the Indian Ocean. In general, there is the summer and the winter monsoon. While the winter monsoon supplies the coast of Oman from November to March with rather weak to middle and inconstant winds from North to South, the summer monsoon is very powerful, reliable and the main reason that Oman has an exorbitant reputation as Kiters’ and Windsurfers paradise. 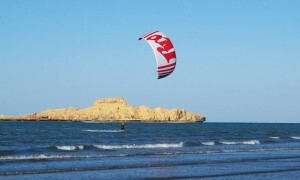 So the best time period for your Kite holiday in Oman is May to September for your perfect kite holiday. If you are looking for a more relaxed kite holiday, we recommend the first or the last third of the summer season. Wind is reliable between 12 and 25 knots, and so not too strong for the average leisure kiter. Perfect time period to spend a kite HOLIDAY under the sun, between the blue sky and white sands. Peak season is from end of June to mid of August. Within that time period you should be ready and prepared to experience really strong wind conditions, since 30 to 34 knots in on daily base is more likely the rule than the exception. Thy sky is often cloudy and hazy in that time. If you are looking for very strong winds – and power as much the lines can resist, you should target the golden middle of the Summer season. According to the summer monsoon the main season for up to 3-5-meter waves is end of June to mid of August. 2. Choose the right destination for kitesurfing in Oman! Without doubts, Masirah Island is the cherry on the cream of the kite destinations within Oman. Here you find an unbelievable choice of various spots within only a few minutes’ drive. More than 10 flat water spots and at least 5 wave spots can be reached even in a small saloon car such as Toyota Yaris. Thanks to the Monsoon of the Indian Ocean, Masirah has a unique climate with constant winds and unbelievably convenient temperatures in a desert country. Usually, the temperatures on the island even in summer don`t exceed 28 to 35 degrees – no matter if the mainland comes up with 50 degrees or more. In the evenings of strong winds compared with the humidity of the sea breeze long trousers and a sweatshirt might be advisable. Apart of the special climate, Masirah Island offers, compared to the remaining east coast of Oman, a good infrastructure such as several good local restaurants, shopping facilities and even a well prepared modern hospital for the worse case. The unexperienced Oman kiter will find several other spots during his research, such as i.e. Aseelah, Ras al Hadd, Bar al Hickman or Quriyat. The spots are quite known within the local scene, mostly because they are easy to reach from Muscat. Unfortunately, most of them are strongly dependent on the tide (lagoons can be empty in low tide), difficult to access or even dangerous to access. 3. 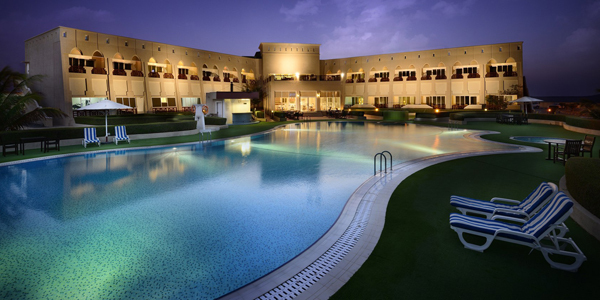 Choose the right accommodation in Oman! Various accommodation options on the island are waiting for you. Right on the spot or alternatively in town, were the surfer scene is gathering every evening with mixed grills, fresh fish or amazing fruit juices. In town you find many different local restaurants, where you get unbelievably good food for a almost no money. In town, there are several accommodations, local hostels, 4-Star Hotel, Apartment-Hotel, exclusive private Villa which are a real alternative to the camp on the spot which offers only limited infrastructure and facilities. Especially the management of the different accommodations make a huge difference in matter of service and quality. Unfortunately, this often changes on a yearly base. We will be happy to assist with our local knowledge, hints and experiences so you will find the perfect accommodation for a VERY SPECIAL rate. No matter if you travel alone, as couple, with your Family or in a group. Just contact us for a decent offer! 4. Choose the right airline and get to know the rates for sport luggage! Please double check the terms and conditions if you are travelling with your own gear and make sure that any kind of agreement you have is available in written and in English with you at the check in for your return flight. Most of the middle eastern airlines offer 30kg as standard luggage allowance. Since Masirah is a Summer destination, 30kg in the belly plus 7 kg in the cabin is often enough to travel within your gear in your standard luggage allowance. 5. Book your car before starting your holiday in Oman! Pre-booking our car ensures the availability of your car on arrival. Furthermore, prices on (European) booking platforms are usually cheaper than if you get your car in Oman. Also mileage usually is unlimited and some insurances are already included which otherwise have to be added with an extra payment on site. Enjoy a great kitesurfing trip in Oman! 6. Book your kite lessons and rental gear in advance! Masirah Island is still one of the few non-crowded kite destinations. Spots are still pretty much empty and you will enjoy a very personal and individual customer service. To enjoy your holiday on the water from the first day, we highly recommend to book your kite services such as lessons or gear rental in advance. Service of pre-booked customers are always in priority, compared to walk in customers. Pre-booked services will be served for sure. Of course, there is always an additional stock for additional customers, but even our capacities on that are limited. If the schedule is full (public holidays or group events on site) walk in guests might not be able to have a kite from the first day in their holiday in that case. Contact us for booking kite surfing lessons or rental gear or find out more about our certified schooling system, our kite surfing courses or have a look at the rental rates! 7. Avoid travelling during national holidays in Oman! The first and the last two days of national holidays (such as Eid Holidays) shall be avoided since they are the main travelling days in Middle East for regional holidays. Especially the ferries to and from the island then become the weak point of your of the usual convenient journey and queuing is sadly replaced by a pretty random chaos. 6 hours dynamic queuing will raise the individual stress level to unknown highs and the one or other car will not get out without scrapes. All in all an unforgettable memory, which for sure you would like to trade into some relaxed sessions on the water. Dates of national holidays as per the info of the local hotels on the Island are 14-22.6. and 19.-26.8.2018. Looking forward to see you in Oman!